Take a Deep Breath, Guys. Now, if you care to, read the actual document. Perhaps it is not clear to Juror Coco that this policy is not intended to censor or dictate communication made by other elected officials; that is absurd. It is regrettable and unfortunate that he did not seek clarification on this before launching a spurious attack against another elected official. I don’t understand the motivation. If the intent of the language was unclear to him, then he could have easily picked up the phone and reached out. 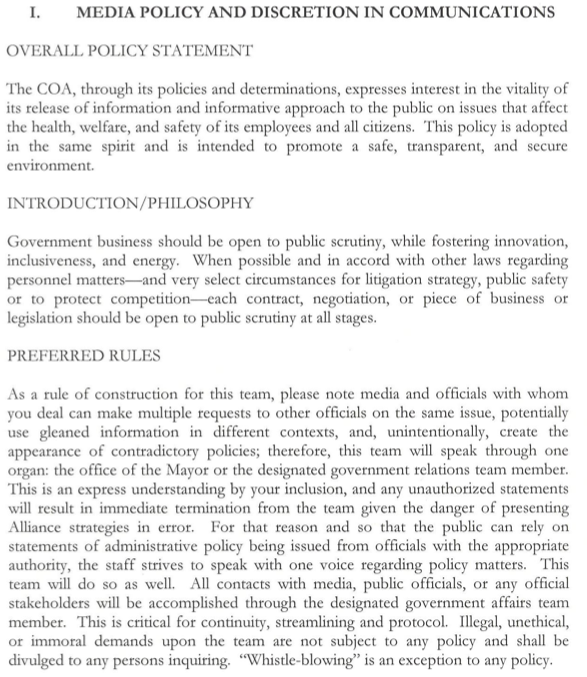 Regardless, the policy concerns statements made by team members on behalf of those officials. In order to accomplish this, the policy outlines that the Alliance, which is tasked with resolving issues with levee certification, will rely on a single point of media contact to field and answer any and all questions (i.e. “the designated government relations team member”) related to the work of the Alliance. That single point of contact works with all three agencies- the Police Jury, the City of Pineville, and the City of Alexandria; again, he is the government relations team member. This is standard operating procedure on all levels of government and for the vast majority of large businesses and corporations; it is intended to ensure that information disseminated is accurate, consistent, and supported. Ironically, the document to which both Mr. Aymond and Mr. Coco are referring spells out the actions and the goals of the Alliance exhaustively. No one is trying to hide anything. What really started me on being son (sp) anti-Jacques was not all of his continual lies, but was his bullying tactics of getting Steve Coco fired. If Jacques gets reelected he will do so without my vote. You can see that whatever disgust that Jacques has for me, I have even more for him. Your vitriol and hatred toward Mayor Roy– comparing him to Hitler and bin Laden and constantly accusing him of lying simply for not being quoted as agreeing or reinforcing your opinions– has more to do with Steve Coco than with anything else? Does he approve of it when you reference him in order to justify calling the Mayor “Adolph Hitler”? Classy stuff. Steve Coco, what a blast from the past! It sounds like the guy doesn’t want to give up on his mission of being the King of Cenla Media. I’m with you though, Lamar. The guy doesn’t host the news anymore. Wasn’t he fired from that too? I can’t believe he was elected to anything… but that’s beside the point. If I were you, I really wouldn’t worry about Coco or Aymond. They both look like bums starved for attention. Greg Aymond deserves our prayers. He is consumed with far too much hatred. Before his stroke, I saw him every now and then. I would have never guessed he would be capable of being such a hateful man. I will pray for his healing and health. Doesn’t Greg Aymond live off of checks from the government? Yes, Greg Aymond does live off checks from the government, of course that is the money Greg Aymond has paid into the government over the past 35 years. Also, wake up peaple and pay attention to Jacques Roy’s lies to you. Of course I don’t expect Lamar to say anything different esepcially since he works for Mayor Roy. I stand by and am not ashamed of anything that I write. You’re engaging in the most vitriolic and hateful brand of political discourse: comparing an elected official to Hitler and bin Laden, making reckless and inflammatory accusations about this man’s character, and attacking people in our community who support him. Considering you’ve endorsed Steve Coco for Mayor and that you’ve admitted your real interest in attacking Mayor Roy is because you ignorantly continue to believe that Roy somehow got Coco fired from his unpaid morning radio gig, I have to wonder: Do you think your over-the-line, vile attacks against Mayor Roy are helping Mr. Coco’s rumored candidacy? I also wonder if Mr. Coco appreciates that his number one cheerleader on the blogosphere is “doing his bidding” in such a contemptible fashion. I wonder if Mr. Coco endorses your comparison of Mayor Roy to Hitler and bin Laden. You should tone it down, Greg. You attempt to present yourself as an educated professional; in my personal opinion, you are not behaving intelligently or professionally. Ed Hooper (WeSawThat) accused you of being unethical, and you’ve sued him for defamation, right? You’ve boasted about how you’d take the suit all the way to bankruptcy court, right? I suppose that you believe, as a lawyer, it is also “professionally ethical” to publicly label a fellow lawyer as “Hitler” or “bin Laden.” Is that ethical, Greg? Aren’t you duty-bound to provide “candor to the public”? Seriously. If someone called you those names, would you also sue them for defamation? Ed just said he thought you were “unethical,” right? Didn’t you share attorney/client e-mails with him? Weren’t those e-mails related to your work on behalf of a group of white nationalists? I know you’re not ashamed of anything you’ve written; I just wonder if Steve Coco is. On the “ethical” side of things, technically the model rules, which Louisiana has substantially adopted (with most of our changes and addendums being related to legal specialization and attorney advertising) require candor to the tribunal. A lawyer is also not supposed to make false or misleading statements of material fact or law to a third person. Conversely, if an attorney believes that another attorney has engaged in unethical conduct, he is duty-bound to report it. On a side note, Lamar, that is a great picture of you in the beret on “Central Louisiana Politics”. Just think, you could have been Chavez, Castro, Trotsky, or one of a whole host of other possibilities. But, no, you got Che – that’s the “progressive” equivalent of winning a Brad Pitt lookalike contest, isn’t it? Good God, with the lies that spill from Jacques Roy’s mouth, it appears that he should be worried about this ethical requirement that “A lawyer is also not supposed to make false or misleading statements of material fact or law to a third person”. So says the guy whose blog features a picture of the Mayor of his hometown distorted to appear like Hitler, an image of a noose with the caption “Freedom of Expression,” and a banner link to a YouTube video “tribute” to the Confederacy. Yeah, Greg, you’re REAL mainstream– an everyday American who was once a member of the Ku Klux Klan, recently represented a group of white nationalists, displays a noose on his blog as a symbol of “freedom of expression,” has referred to African-American public officials as “n****a street thugs,” has stated that “ethics among blacks is usually a lacking character trait,” and has accused the Mayor of only being interested in investing in “black” neighborhoods (which, to me, proves that you don’t know anything about the demographics of your own hometown), all while sitting behind a computer in a home that is only a couple of blocks away from the single-largest infrastructure project in the City of Alexandria today. You do live close to Versailles, right? Although you may think it’s a “sport” to continually attack my character, to paint me as something that I am not (a socialist intent on the redistribution of wealth, a propagandist, a liar, a spoiled brat, etc. ), I believe that whenever you engage in this type of public communication, you are severely undermining your credibility as a fair-minded, objective, professional, and honorable lawyer. How are your attacks, in any way, professional or responsible? You’ve portrayed the Mayor as Hitler, bin Laden, Stalin, Mao. Mass murderers. Racists. People who sought to destroy our country. For many, synonymous with pure evil. It looks like you just want attention, because comparisons like the ones you have made are reckless, incendiary, and hateful. On a very basic level, they’re ignorant, but more importantly, they undermine and cheapen the brutalities of those who were victimized by Hitler, bin Laden, Stalin, and Mao; you are painting a caricature of their suffering and grief. You’ve spent hours manipulating images and manufacturing allegations. To what end? Honestly, Greg, it’s crazy, somewhat off-the-deep-end stuff. Show up for a meeting. You haven’t been to a single administrative or Council since Roy was elected, right? If you’re so concerned, pick up the phone and ask questions. If you want to participate in the media briefings, then show up for one, instead of simply complaining about the time it appears on your television. You’ve never appeared at a single media briefing, correct? Call me what you will Lamar, but I know I am not a pinko liberal like you. You call me a “pinko liberal,” and I can call you whatever I want? Just want to make sure I know the rules.